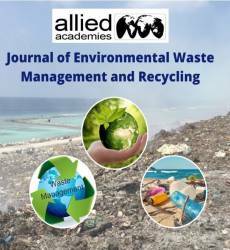 Journal of Environmental Waste Management and Recycling offers an effective forum for the policy-makers, government agencies, academics and research institutions, and professionals working in the field to disseminate information. The journal serves as a channel of communication through the documentation and broadcasting the research outcome of the international and government bodies, universities, research organizations, aid agencies, industries, environmental scientists, and professionals in the field of environmental and waste management. The journal considers wide range of topics for publication including - Environmental Science, Biodegradation, Environmental Toxicology, Marine Science, Renewable System, Ecosystem, Waste Management, Recyclable Waste, Solid Waste Management, Nuclear waste, Waste Water, Construction and Demolition, Chemical Waste Management, Used oil disposal, Garbage, Trash Removal, Paper recycling, Dunnellon waste management, Electronic waste management, Integrated waste management. The Journal of Environmental Waste Management and Recycling publishes original and review papers, technical reports, case studies, conference reports, management reports, and notes commentaries and news on all aspects of environmental science, engineering and technology and management worldwide. Special, themed issues on relevant topics may also be published and all articles are pee-reviewed and published under the guidance of our Editorial Board members.